Haven, an organization in Pontiac that provides comprehensive programs and services for survivors of sexual assault and domestic violence, has named Aimee Nimeh as its president and CEO. 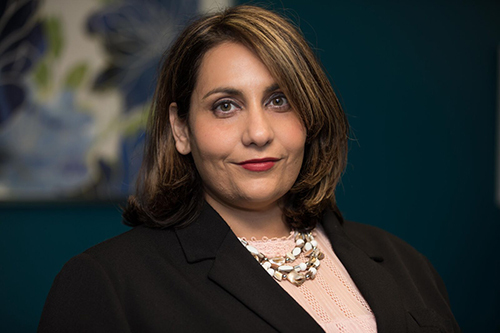 In her new role, Nimeh will be responsible for the strategic direction and oversight of Haven’s services, including its emergency shelter, crisis line, counseling, advocacy, forensic exams, community resources, and educational programming. The nonprofit provides these services to more than 30,000 people each year in Oakland County and the surrounding area who have been impacted by sexual assault and domestic violence. Nimeh previously served as the executive director of Susan G. Komen Greater Detroit in Southfield. While there, she was responsible for transforming the Detroit Race for the Cure program into Susan G. Komen Greater Detroit, an affiliate of the Susan G. Komen Foundation, the world’s largest nonprofit source of funding for the fight against breast cancer. Nimeh also served as project director at the Michigan Domestic and Sexual Violence Prevention and Treatment Board and is a faculty member at Wayne State University School of Social Work. Nimeh also spent seven years at crisis service and behavioral health agency Common Ground in Bloomfield Hills. During her time there, Nimeh advanced through several positions that lead to her role as vice president of programs and services. Nimeh began her career at The University of Michigan Sexual Assault Prevention and Awareness Center in Ann Arbor. Nimeh earned both her bachelor’s degree in sociology and master’s degree in social work from U-M. She also received an Arabic language certificate from the University of Jordan Amman. Haven has worked to address and prevent sexual assault and domestic violence for 43 years and is Oakland County’s only organization that offers comprehensive programs and services to survivors.